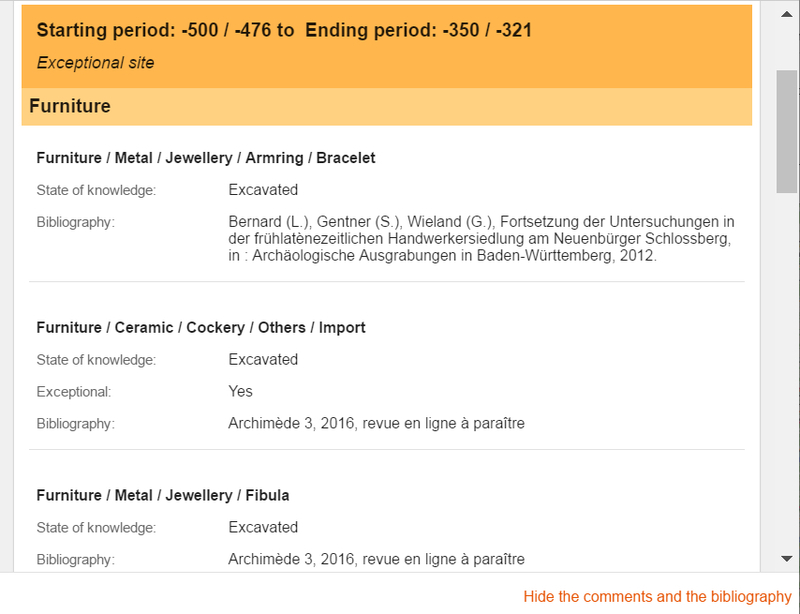 ArkeoGIS offers three different levels to read the informations displayed when the user get a map result from his query. These are : the icon, the tooltip and the site sheet. They are subsequent and complementary. The informations available for each of these levels is displayed below. The mapping interface's icon allows the user to access the following informations. The size's icon is indexed to the most precise " state of knowledge " among the different characterisations of the site. Six sizes are possible, from A to F, A being the smaller one : Unknown (A), Literature (B), Airborne Survey (C), Foot Survey (D), Probed (E), Excavated (F). The size of this icon does not increase gradually. Probed and Excavated are the most visible since they describe a more accurate state of knowledge. An invert drop is used when the localisation of the site is accurate. The tip of the drop is located at the precise location of the site's coordinates. The contour of the sites with at least one characterisation described as exceptional by the author are thick and black. The background colour of the icon is related to the colour code of the chronological period that the user has chosen in his profile. This colour is defined according to the most recent ending period of site's characterisations. Gradations are used to indicate the precision of the dating : the darker the colour, the more accurate the date. In every chronological system, a grey icon display a site with a least an ending period classified as unknown. If a site refers to a different chronological system than the one on the personal project of the user, the icon is white. At the center of the icon, a letter indicate the query that has led to the result displayed on the map. From A to Z, there is a maximum of 26 queries displayable at the same time on the mapping interface. When the cursor moves on an icon of the mapping interface, a tooltip appears above this icon. The tooltip is slightly transparent to ensure a good viewing of the mapping interface. 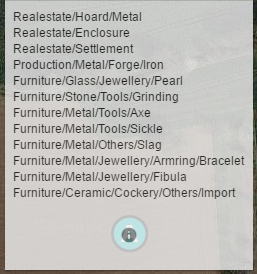 The upper part of the tooltip summarize the ID informations about the site. The site's name is followed by the original ID of this site into the original database. - the end of the most recent period with a characterisation on the site. The lower part of the tooltip displays a summary of the informations related to the site (on a greyish background). The list of all the characterisations related to the site. When there are more than one characterisation on the site, they are organized by category in the following order : real-estate, furniture, production, landscape and media. When clicking on the "i" icon of the tooltip, a sheet appears and allows the user to consult the available informations for the site. In the upper part, the informations of the tooltip are summarized again. Author's name : Thanks to ArkeoGIS' directory, it is possible to contact every author or initiator of the site's informations. The chronological periods are also displayed on the upper part of the sheet. ArkeoGIS uses 4 dates to presents this information : the starting and the ending date of the starting period and the same for the ending period. If these chronological limits match with the user personal chronological system, the corresponding period's name is also displayed. Coordinates (WGS84) : latitude and longitude, if documented, the height is in meters. City's name : Name of the city where the most important part of the site is. Coordinates accuracy : Accurate if given by the author, centroid if indicated as such during the import. Occupation : It could be Not documented, Single, Multiple or Countinous. Date of the sheet's creation : As described on ArkeoGIS' protocol, this date indicates the last update of the informations by the author. The characterisations are ordered in relation with their dating. The most recent are higher on the list. Then, they are presented according to their categories (in this order : real-estate, furniture, production, landscape and media). For each characterisation, ArkeoGIS presents a state of knowledge, the exceptional classification (either yes or no), comments and bibliography. If the user wants or needs a shorter sheet, the last informations can be hidden.